SANAA, Yemen — The Saudi-led coalition targeting Yemen’s Shiite rebels mistakenly struck a wedding party on Monday, killing at least 38 people, Yemeni security officials said. 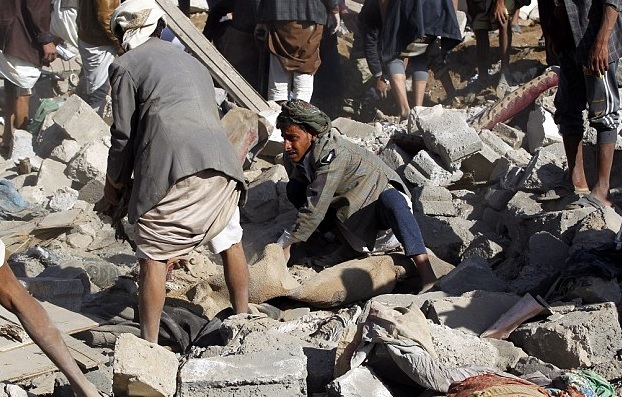 The strikes hit the celebration in al-Wahga, a village near the strategic Strait of Bab al-Mandab, said the officials, who remain neutral in the conflict that has splintered Yemen. At least 40 people were wounded in the two airstrikes, they said. The strikes, a senior government official said, were “a mistake.” Many of the victims were women and children, according to several villagers. Yemen has been embroiled in fighting that pits the rebels, known as Houthis, and forces loyal to former President Ali Abdullah Saleh against the Saudi-backed and internationally recognized government as well as southern separatists, local militias and Sunni extremists. The U.S.-backed coalition has been carrying out airstrikes against the rebels and their allies since March.